Munikurnuka Ghat. Benares, from the river. bl.uk > Online Gallery Home	> Online exhibitions	> Asia, Pacific and Africa Collections	> Munikurnuka Ghat. Benares, from the river. 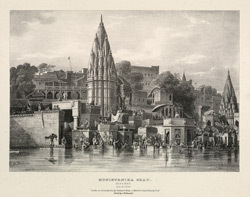 Plate 3 from the second part of James Prinsep's 'Benares Illustrated'. Prinsep (1799-1840), an antiquary and colonial administrator was assay master at the Benares Mint between 1820-30. The lithographs published in this collection were based on his original sketches of the various views of the 'holy' city of the Hindus. Of this view he writes: 'This view is intended principally to exemplify the structure of the ghats on the water's edge. The continuity of the line of steps is interrupted by hundreds of stone piers of various forms, which may be classed under three distinct heads. Some are merely intended to give solidity to the masonry...others are built for the accommodation of the ghatecars (ghat-attendants) and Gungapootras (sons of the Ganges), who enjoy hereditary possession of most of the ground between high and low water mark: the third sort consists of muths and murhees (small temples) erected at the expense of pilgrims and others:...The octagonal muth towards the right hand, marks the south corner of Ahulya Baee's ghat: one of the niches outside is embellished with a small white marble figure of this celebrated princess in a sitting posture...'.